NASA's Mars Curiosity Rover has completed a Martian year –687 Earth days– this week. The vehicle travels through an arid and reddish landscape that was home to glaciers in the past. Ancient Mars held large quantities of water, yet its global hydro-geological cycles were very cold, so much so that they induced the presence of a giant ocean, partially ice-covered and rimmed by glaciers on the lower plains of the northern hemisphere. More information: Alberto G. Fairén, Chris R. Stokes, Neil S. Davies, Dirk Schulze-Makuch, J. Alexis P. Rodríguez, Alfonso F. Davila, Esther R. Uceda, James M. Dohm, Victor R. Baker, Stephen M. Clifford, Christopher P. McKay, Steven W. Squyres. 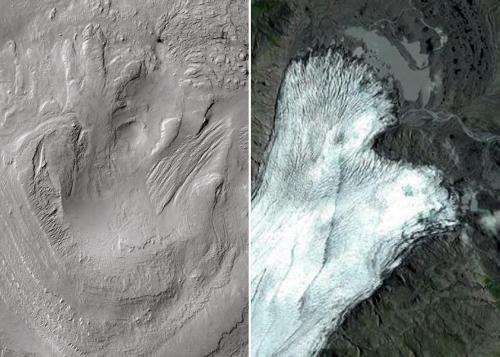 "A cold hydrological system in Gale crater, Mars". Planetary and Space Science 93-94: 101–118, 2014.